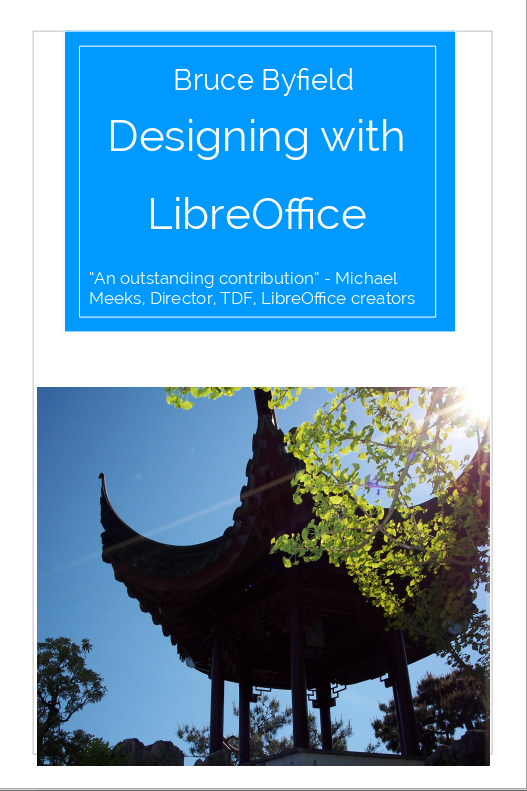 Designing with LibreOffice is not the usual death march through the menu and standard tasks. Instead, the book takes two fresh approaches to the world’s most popular free office suite. First, it explains the importance of using styles and templates in order to use LibreOffice with the most convenience and the least effort. By taking advantage of styles and templates, you can concentrate on self-expression, rather than format. Later, as you edit, you can make changes more quickly and with more precision. Second, it explains the basics of modern design and how to apply them in LibreOffice, expanding on the open secret that LibreOffice is as much a desktop publishing application as an office suite. It explains and illustrates the possible choices as you design, as well as the pros, cons, and considerations behind each choice — and, in some cases, what you should avoid altogether. The result of these approaches is a unique overview of using LibreOffice. If you are a new user, the book will help you get up to speed with LibreOffice. If you have already used LibreOffice, then this book will leave you with a clearer overview of the program and its capabilities. Designing with LibreOffice was released first as a single book in March 2016. In the following months, it will be published in several sections for those who only want part of its information. Both the full book and the smaller sections will be available for free download, and for sale as printed books. A French translation is being done, and plans for German and Spanish translations are also being made. The first Two extracts, extract, Styles and Templates and Choosing Fonts, are now available on the Download tab. It will be followed by Character and Paragraph Styles; Frames, Lists, Pages and Tables, and Impress, Draw, and Calc. All formats and locales will be available under a Creative Commons Attribution-Share Alike license. Under this license, you can share or copy the book, or even add to it so long as you mention the writer’s name and release your changes under the same license. Whether you use LibreOffice or another descendant of OpenOffice.org, such as Apache OpenOffice or NeoOffice, Designing with LibreOffice can help you improve the quality of your documents.